Electronic communication continues to evolve as the world community continues to demand the transfer of more information at ever increasing speeds. Analog and digital technology is used in both point-to-point and broadcast communications that are being delivered by wireless, fiber optic and cable network systems. In order to develop and maintain these systems engineers need to be able to test and qualify the signals being received and transmitted. Signal loss or attenuation needs to be reduced, noise monitored and key parameters characterized. Furthermore, as systems become ever more complicated sources of error need to be detected quickly and corrected. Utilizing the latest PC based technology, Spectrum digitizers and arbitrary waveform generators make excellent tools for the development, testing and operation of communication systems. They offer a wide range of bandwidths, sampling rates, and dynamic range allowing them to match the expanding range of communication measurement needs. When large dynamic range and maximum sensitivity is required high-resolution 14 and 16 bit digitizers are available for the capture and analysis of signals that go as high as 250 MHz in frequency. These high-resolution cards deliver outstanding signal-to-noise ratio's (up to 72 dB) and spurious free dynamic range (of up to 90 dB) so that small signal variations can be detected and analyzed. For even higher frequencies 8 bit digitizers are available that offer up to 5 GS/s sampling rates and 1.5 GHz bandwidth. In wireless applications, where signal frequencies may even go above 1.5 GHz, the digitizer products can also be used with down-converters to further extended their operational frequency range. Each digitizer card can have from one to four channels (eight channels on lower speed cards) and up to eight cards can be linked together with Spectrum's Star-Hub system to create instruments with up to 32 fully synchronous channels making them suited to applications with multiple input and output (MIMO) transmitters and receivers. With large on-board memories (up to 4 GSamples/card) and advanced streaming and readout modes the digitizers are ideal for capturing long and complex communication signals. Using the streaming over the cards fast PCIe bus to a RAID based storage array allows the capture and storage of hours of information. 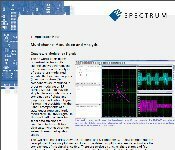 Spectrum's SBench 6 software can also be used to view and qualify I and Q signals. FFT's are available for frequency domain analysis and parametric calculations can be used to characterize timing issues such as leading and trailing edge pulse jitter. 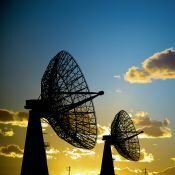 Typical communications applications include wireless systems using RF and microwave, MIMO, wireless LAN's, mobile phones, base station monitoring, surveillance, satellite communications, bus testing, cable testing, antenna and transmitter testing. Self-excited electronics like power supplies, oscillators, transmitters, and signal generators can often be tested using a measuring instrument (digitizer, oscilloscope, spectrum analyzer, etc.) alone. Externally excited electronic devices like amplifiers, filters, receivers, and digital interfaces require a signal source and a measuring instrument for testing.